The Government yesterday said Prime Minister Ranil Wickremesinghe’s trip to the World Economic Forum in Davos was a “resounding success”, helping to boost investor confidence and opening up opportunity for a high profile event in Colombo by the Switzerland-based global entity. 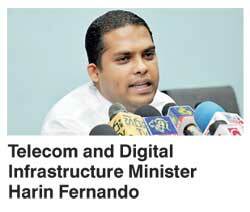 Telecom and Digital Infrastructure Minister Harin Fernando said yesterday a request by the Prime Minister to hold an event of the World Economic Forum in Sri Lanka in 2018 to coincide with the 70th Independence Day celebrations in the country was received positively. The organisers of the World Economic Forum agreed to assess the situation and study the suitability of the country to hold the event, given an unofficial confirmation of acceptance of the invitation. A delegation from the organisers of the World Economic Forum will be in Sri Lanka during the Digital Island Forum planned to be held during end of March, to carry out a feasibility study, he said. Fernando also claimed that meetings the Prime Minister had with different world leaders on the sidelines of the Davos event helped boost investor confidence and dispel any negative image among the international community. “We had fruitful discussions with a number of investors including creator of Alibaba platform Jack Ma and Indian investor Mittal. The Prime Minister met with a number of world leaders and was able to encourage them to come to Sri Lanka. Our country is nothing in the greater scheme of things at Davos, but because of the way our Prime Minister handled the relations we received good response,” he claimed. However Fernando claimed news of protests in Hambanthota was featured in the forum news feed, painting a very one sided image for the international community. Hinting at tightening relations with China, Fernando said Prime Minister Ranil Wickremesinghe meeting with the Chinese President Xi Jingping was fruitful. Meetings with leaders in information technology, including Microsoft and Japan, were also successful, indicating the possibility of greater engagement in Sri Lanka, he said. The World Food Program Executive Director Ertharin Cousin accepted an invitation to visit the country to assess the drought situation in the country and provide necessary assistance, following a meeting with Wickremesinghe. When asked if investors displayed willingness to invest in the country in the current political environment, Fernando insisted that investor confidence has grown over the last two years despite Bloomsburg listing Sri Lanka as one of the 14 riskiest countries to invest. Emphasising that there was a serious economic decline during the last Government, which he claims prompted Former President Mahinda Rajayapksa to call for an early election, Fernando insisted that over the last two years the current Government has been able to stabilise the economy, earn a good Fitch rating and create a conducive environment for foreign investment. Fernando was on the defensive when questioned on why much publicised recent investments have gone sour after initiation, claiming issues regarding the Horana Tyre factory investment was due to a disagreement between the BOI and the relevant ministry. He also said that no accusations of money laundering levelled against Rajapaksa loyalist Nandana Lokuwithana have been proven. Referring to the Volkswagen fiasco, Fernando claimed that it was explained from the beginning that the international brand may come in later.